Having owned Cats my whole life, I've always been a keen observer of their behavior. Well, lets face it, they are beautiful to watch-from when they are mischievous kittens to their adolescence and adulthood Cats are a synonym of playfulness, grace and peaceful furry beauty. Until recently I have lived in a small city apartment where there was not much space for Cats to roam-not that they minded having spent most of my wake time sleeping and gracefully ignoring me:) But when they were awake my two adventurers were always aiming to get to high places, kitchen cabinets, wardrobe, table, even boilers or shower cabinets. So, why do Cats love high places and what can we do to help them? Cats are domesticated, but their instinctive knowledge - imprinted from living for millenniums in the wild - has not faded. Cats share a strong instinct to climb, compelling them to seek out high places. From a raised perch, they're able to observe their territory without worrying about predators, and can wait with an eye out for prey. Cats also instinctively seek out hideaways as part of their natural behavior, both for hunting and protection. That's why they seek out the shadows, the secret perches, and why, when you least expect it, you notice eyes glowing from some dark space between the wall and the couch. Adult cats also use their climbing ability to avoid potentially confrontational interactions with other members of their own species. Queens (mother cats) may also do this to avoid their kittens, especially during weaning time. So, in addition to all these reasons programmed through evolution, why does your domestic pampered feline still like to sit in high places? There are other factors that may promote this behavior in your cat. It may depend on how busy or quiet your household is. Your cat most likely wants to keep an eye on her environment and increase the likelihood that she will not be disturbed. What can we, as loving Cat Moms and Dads, do to help our furry babies? Does your home have the right places for your cat, or is she just making do with what is available? Make sure your home has places where your cat can get away and just be her cat self. 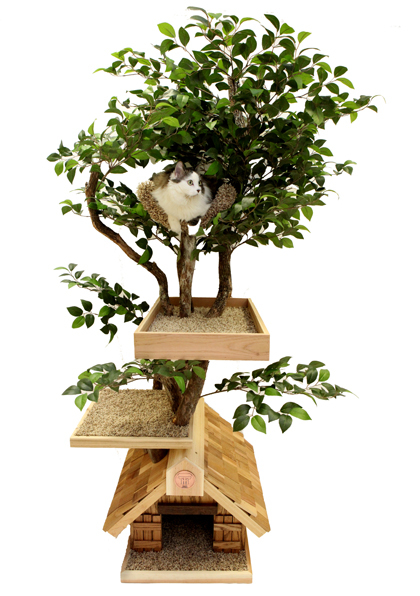 Cat furniture in innovative designs can satisfy your cat's hiding need, and be both comforting and stimulating, affording an excellent place to sleep and play. 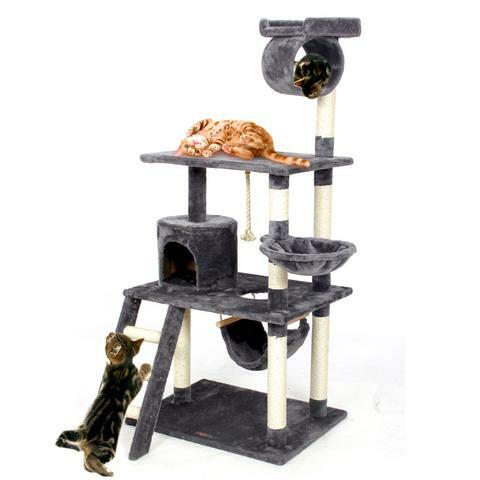 A variety of Cat trees are available on the market which can satisfy their need for hiding climbing and scratching. May your felines be happy - their lounging spots high and their nails trimmed.